When I asked recently for blog post suggestions, I was so flattered to receive questions about our home renovation. It’s centre of my mind at the moment, so it’s quite an easy topic for me to write about. And while I find it completely overwhelming — all the details and decisions to make — I also find it SO FUN! It’s a creative process I really enjoy, even if it keeps me up at night with visions of tiles and kitchen taps. I’m not sure how much you all want to know, but I’m happy to share if you’re interested. So brace yourself for a loooong post, the first of many I’m sure. 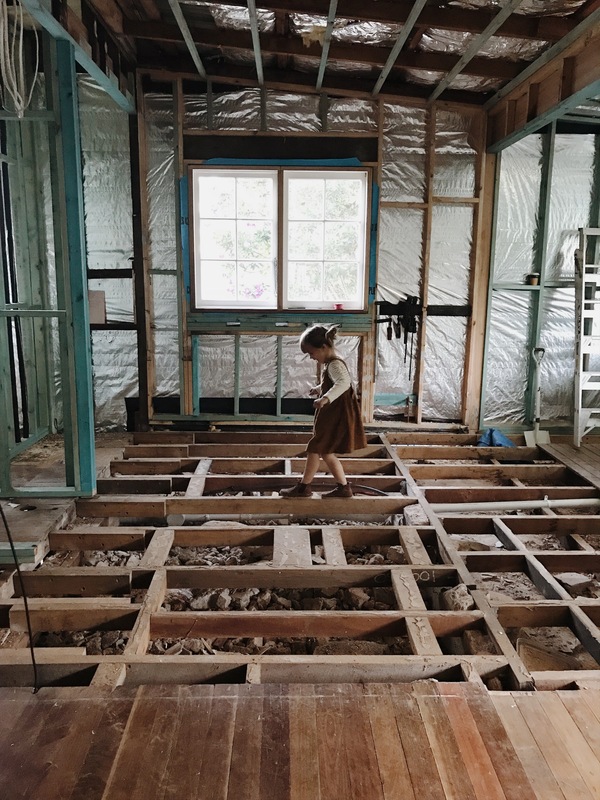 It’s been more than 7 years since we renovated our London home, and three years since we have had a house of our own, so I was really excited to take on a project again and to create a home for our family. We house-hunted for more than six months, exploring so many different options and areas, before we found this home. The house, which happened to be just down the street from where we’re living, came up for sale and Michael suggested I take a peek. I was reluctant for a few reasons. For one, I was hoping to buy something on more land — ideally with sunset views over the pretty rolling hills in our area. I also thought this house, with only 3 bedrooms, would be too small for our big family. But Michael convinced me to go see it anyway. It turned out that I wasn’t the only one interested in a peek. 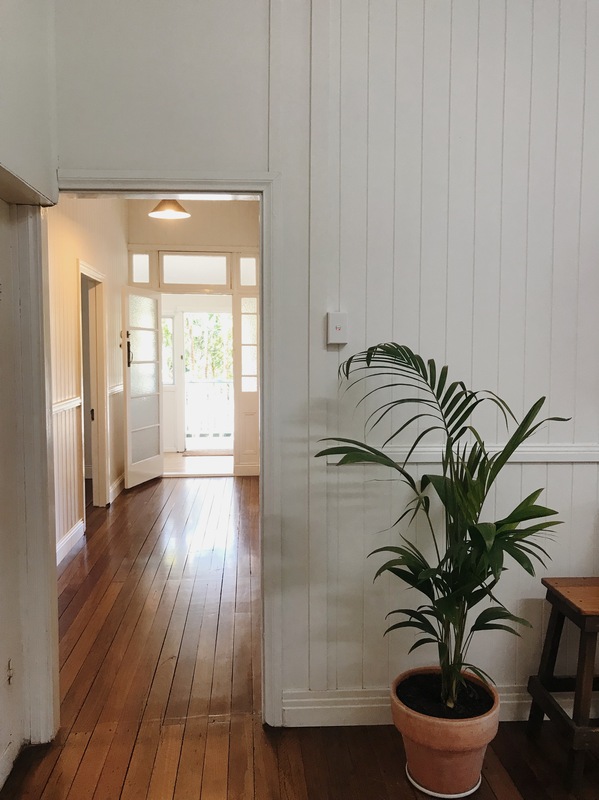 When I walked into the ‘open house’ I found dozens of other keen house-hunters milling about, yet I felt at home immediately. As I stood there surrounded by all these people, I was overcome by a strange impulse to kick everyone out of ‘my’ house! Isn’t it funny how you just know when it’s right? 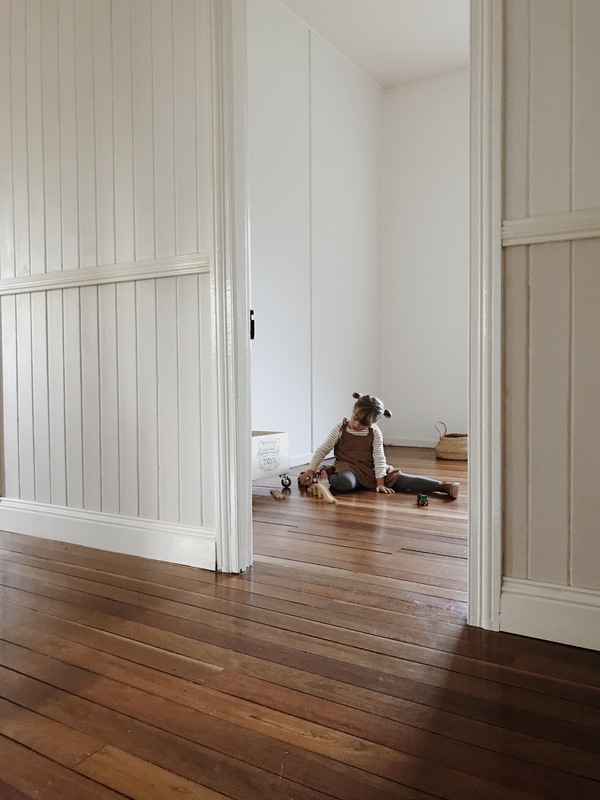 As I walked through the house I was moved by the sense of history within its walls, and I had visions of my children running up and down its halls, creating their own memories in this special home. Here are some photos of the house before we started doing any work on it (how pretty are all the panelled walls?!). Perhaps it was because of our many years living in old homes in London that I was immediately attracted to this house. 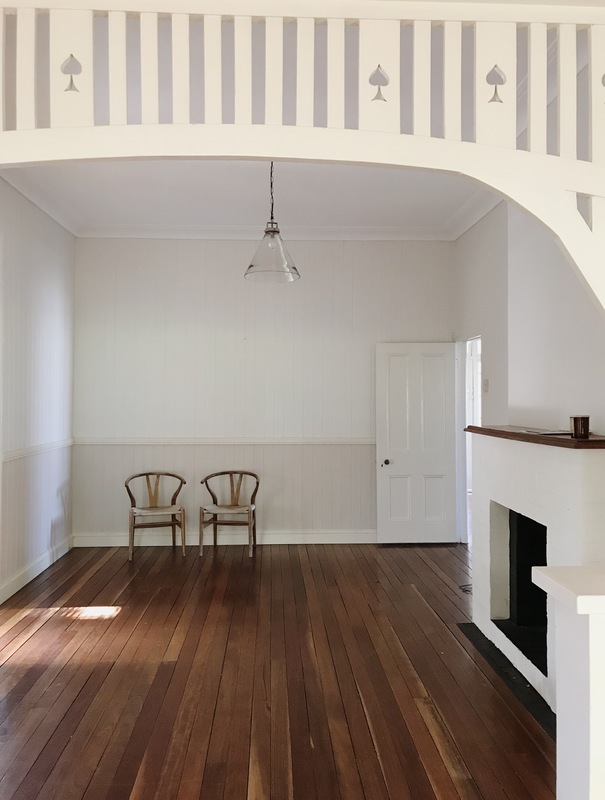 With its original wooden floors, old timber windows and tall ceilings, it felt familiar and comfortable. It is more than 115 years old, very old in these parts, and was one of the first homes built in our neighbourhood. 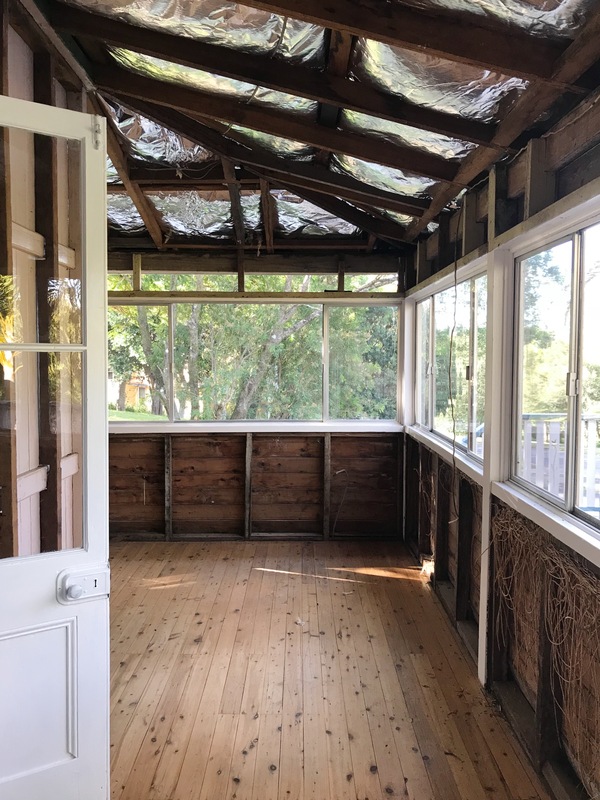 While there have been some additions made to the house in the past 20 or so years (an old porch enclosed to create a sun room), the majority of the house remains in its original state. And location wise, it is pretty perfect — the house sits on a verdant plot on a quiet street in town — literally a 2-minute walk to the village and shops. Having older kids, I have realised how important it is for them to have the independence and freedom to walk into town, to meet up with their friends, to take the bus into school, etc. — and it’s quite convenient when you run out of butter or milk to be that close to the shops. What we will lack in acreage (and sunset views), we will make up for in ease of living, less time in the car, and freedom for our kids. The driveway is located at the side of the house, so while the original entrance is at the front, we decided we’d mostly be entering the house from the side. We designed the layout of the house accordingly — adding a laundry room just off the entry (a place to throw wet beach towels and dirty clothes as you enter). We knocked out the old bathroom at the top left corner on the old floor plan. This is the northwest corner of the house — the sunniest spot. By making this living space, we’ve allowed more light to flow into the adjacent rooms. The kitchen is the hub of our home, where we spend the most time. We decided to create a big kitchen with windows and doors flowing onto the back deck and garden. I am most excited about this space! Here is a kitchen I’ve used as inspiration. And here is a second one. We are leaving the bedrooms mostly untouched, except we’re adding built-in bunk beds in the girls room to allow them to have more play space in their room. (Also, my girls don’t share a bed as well as my boys do, so they’ve asked for their own beds!) Here is an image I’ve used as inspiration for their room — I love how the panelled wooden walls incorporate the bunk beds. The old sunroom and study had metal windows throughout. We are replacing those windows with traditional wooden casement windows in keeping with the style of the original home. I managed to find 20 matching old windows from an architectural reclaim place nearby. (I’ve had this image in mind for what I hope the space will look like. Wilkie’s room will be so cute!) Those windows are going in this week and I’m so excited about it. In terms of the design process, I have actually found it to be pretty straightforward. Because I’ve renovated an old home before, the design choices we’re making in this home are not too different from ones we made in our London home. We really want to honour the original style of the house, so we’ve used this to guide us in our decision making. We’ve chosen older, traditional-style taps in our bathrooms, I decided to use traditional subway tiles in the showers, hexagonal tiles on the floor, and our kitchen and laundry room are going to have the same shaker style wooden cupboards and drawers as our London home. The aim is to make the house feel like it’s always been this way. I’ve created a Pinterest board for our renovation project and have pinned so many inspirational photos. It really helps me to have visuals to reference when making decisions (what did people do before Pinterest?!!). 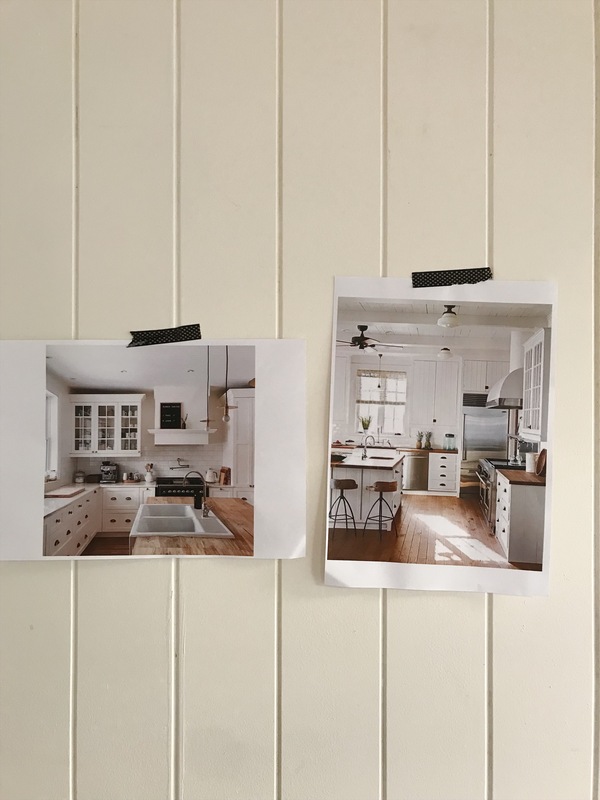 I printed some of my favourite images before renovations began and taped them up in each room — this really helped me to visualise each space, and it also helped me to explain to our architect and the builders what I was hoping to achieve with each room. So far we are about 5 weeks in to the renovation, and we probably have another 7 or 8 to go. Most of the decisions have already been made (phew!) apart from paint colours, which is a whole headache of its own. Any paint tips send them my way! I’ll try to get another post up when I have progress to share, and then of course I’ll share photos of the house when it’s finished. I can’t wait for that! In the meantime, I’ve been sharing progress photos on my Instagram stories. Please feel free to share feedback and ideas. I’m also happy to answer questions too! Hi Courtney! Thanks for the update and this amazing post, I really enjoyed reading it! I have a question for you regarding your kids sharing bedrooms. We recently moved into a new flat and it was about time since I’m 35 weeks pregnant with my second baby (I read your post about not finding out the gender by the way and loved it so much that we don’t know if it’s a girl or a boy). 😉 My idea is to cosleep for the first 6 months at least like I did with my daugther, but then I’m hesitant about putting the baby with my 20 months old daughter (she’s a light sleeper) or in its own bedroom. Did your children share a bedroom from that early on?? And if so, did your older kid woke up more frequently as a result? Also since I don’t know the gender, would you have put your kids to share a bedroom if they had been from a different gender? Many thanks! Warm regards from sunny Barcelona!! After the renovations on our house are finished, we’re hoping to build a little studio in the back yard. 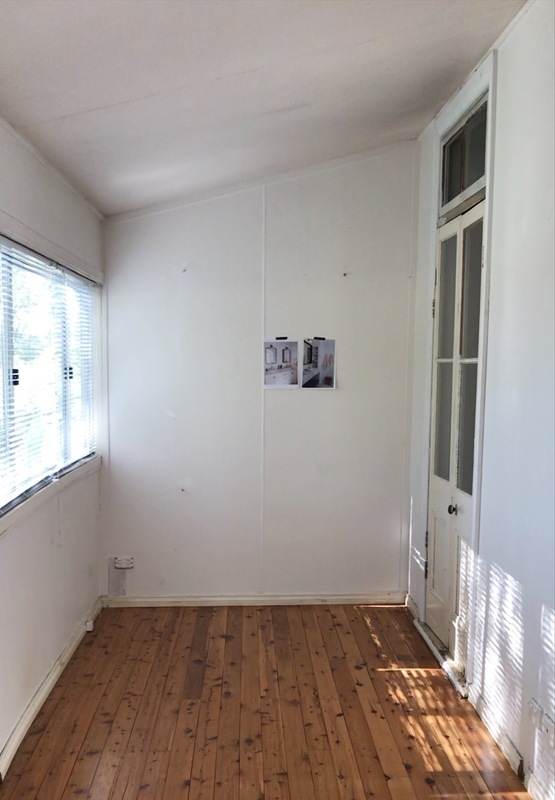 The studio will be small — just a bedroom, small seating area (with a desk for using as our home office) and a tiny bathroom with an outdoor shower. This is where guests can stay when they come visit and we’ll use it as our office at all other times. I’ll share about this too when we start working on it! So beautiful – love the simplicity and how you are honouring the home’s original style. Do you think this will be your “forever” home? If so, has that effected any design decisions? Thanks for your sweet comment. It makes me innumerably happy that you’ll soon have your own permanent space to call HOME there in Australia. Yay Adamos! How exciting! Can’t wait to see photos of when it’s finished. Loved your London home. I LOVE this post and am so delighted for your family, what a lovely home it will be! We recently made a new kitchen and mudroom in our 200+ year old stone house and wanted it to blend simply with everything else. For colors, my favorite is Farrow and Ball’s Cornforth White as a trim and cupboard color against a crisp white (plaster) wall (like Benjamin Moore’s Simply White). It is particularly dreamy when used on Shaker pegs. It’s timeless, airy, and clean. I ended up wanting to repeat it all over our house. Thank you for sharing your progress! Thanks for your comment. Lucky you that you grew up in this area! After going back and forth about aircon, we’ve decided to bite the bullet and invest in two (hidden) aircon units — one in the kitchen (in the vacant space above our fridge) and one in the living room, hidden behind the wall, accessible from the hallway. This means we’ll probably be super hot in our bedrooms, but the cost to duct the aircon throughout the whole house was so super expensive. For heating, we will be putting back in the old wooden stove. We’ll also have a gas unit we can use in the winter when it’s really cold and we don’t have time to light the fire. (We’ve also made sure we’ve insulated under new floors and in walls. These Aussie houses are so badly insulated for the cold winters! I think we are leaning to Natural White for the interior walls. I just have to find a good colour for the kitchen that compliments this warmer white colour but doesn’t look too warm compared to the marble! Dilemmas dilemmas! We’re also in the midst of a renovation, so it was lovely to read about someone else’s plans for once (they look great!). We’re actually coming towards the end of ours but I do have a paint colour suggestion for you …though I’m sure you probably don’t want another colour to consider!! We have a bright older style home and we’re also going with shaker cabinetry and more traditional fittings. I had so much trouble picking a nice white that worked well in all our rooms. Some of the whites like Natural White just looked far too creamy and others like lexicon were too icy and stark, even in the half and quarter strength. Our painter was doing an under coat in a white paint called Builders White. I know, it’s a terrible name but it is a proper paint colour, not just an undercoat paint. Anyway, long story short the colour looked great on all the walls, it’s just a nice bright white, no blueish or grey or creamy tinges in sight! Despite its terrible name i would recommend it for anyone just looking for a white paint that is fresh and bright and just looks “white” on the walls. Which is actually harder to find then it seems! Anyway, whichever colour you pick I’m sure it will look lovely! Congratulations on your lovely home and best of luck with the renovations! Thanks for the paint tip! Thanks for your comment, Alex. Yes, as Wilkie grows (hopefully not for a few years! ), I’m sure he’ll want a room that is not connected to ours. But the hope is that we’ll be able to shift things around by then. We’re hoping to build a little studio in the back yard (for guests and to use as an office), and Easton might want to move into the studio in a few years. At that point, we can use Wilkie’s room as our office and Wilkie can move in with Quin or the girls. Yes, my boys still share a bed. They actually really love doing so. We’ve offered them their own beds over the years, but they are perfectly happy still sharing a bed, which makes things quite easy. The new layout looks great! Remember your never going to have everything you HAD (in London etc) & everything you are GETTING, there is always a trade off. For paint colors I would stick to a ” fresh linen” type of white ( I think it may be the exact name of a benjamin Moore paint we used) & use some teals, oranges, rich grays and/or vintage style wallpaper as accents. Good luck! Love it! So exciting. Does Wilkie’s room have its own entrance or do you have to walk through the master? Unfortunately, you have to walk through the master to get to his room. I think it will be fine for a few years, at which point we might move him out of this room and convert it to a home office. We contemplating creating a door to his room from the original front door entrance/hallway, but then we couldn’t fit in a closet in that space. We’re trying to make the most of what we have, and unfortunately this was the best solution. Paint… issue of mound can be a problem with the humidity. My sister lives in far North Queensland and one tradesperson told her not to paint the house white due to mould. It was the most ill informed comment. You can buy mould resistant paint… and make sure it’s prepared properly by a professional residential painter in your area. You can then paint whatever colour you want and you should have years of enjoyment but do spend on getting the right paint for your environment. I am so excited for you guys about this and it looks wonderful!! I am sure it is going to be even better when it is finished! Oh it looks adorable! It’s great to see what you are building for your family. Being from Europe, I wonder if the houses in Australia don’t normally have a second level? Is there a reason for that, do you know? What a lovely house !!! And lovely inspirations too ! I’m sure that you’re going to be so happy in here ! If you’re looking into greys at all we did dulux tranquil retreat in half strength and I absolutely love it! The perfect grey, not blue, not beige, not greeny, love it. Our house is old too and we paired it with porters paints Snow White on trims and above the picture rails. 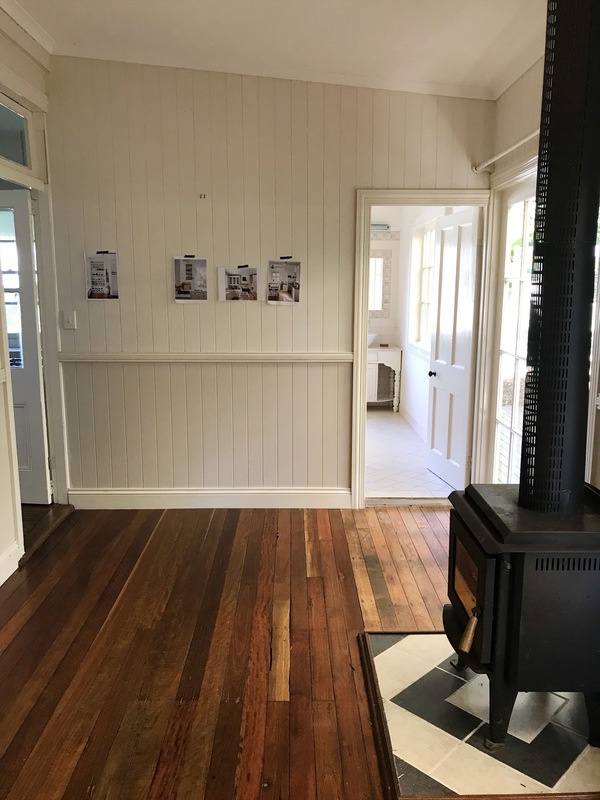 We also painted our jarrah floorboards with porters floor paint in Snow White which has actually gone more off White over time but I like that contrast now (despite using tannin blocker!!!) In the 70s back extension of our house that we are renovating we are doing Snow White everywhere. It works well as it’s very sunny and light there and our floorboards are pale oak. Good luck choosing your paint! The house looks beatiful, can’t wait to see it all finished and turned into a home! It’s such a lovely house and I’m sure will be amazing once the renovation is finished. I’m pregnant with my 3rd and just like you are doing for Wilkie our new baby is going to have a cozy little space in one end of our walk in wardrobe. When I tell people some of them laugh but I think it’s a perfect space for a little person. This is so exciting, what a beautiful find. There’s something about the quality of light and warmth that reminds me so much of the house with the yellow door. Hope you’ll have many happy years here. thank you so much for sharing your beautiful renovation plans, its such a pleasure for me to be allowed to accompany it, as I’m very interested in all this house/home stuff. I’m convinced that it will be very beautiful and I’m especially pleased that you have chosen a house that maybe seemed a bit too small for your family, but feels like home for you. We also live in a flat that actually seems too small for a family of 5, but sharing our bedroom with the living room is possibe to live still in the green in the middle of the city and being so close to each other is a very nice thing. So thank you again. kind regards G.
Thank you for sharing this post on your renovation. The house looks absolutely beautiful and you have such good style I know it will be amazing once it’s finished. I loved seeing glimpses of your other homes. We are currently renovation our 1930s semi in England. 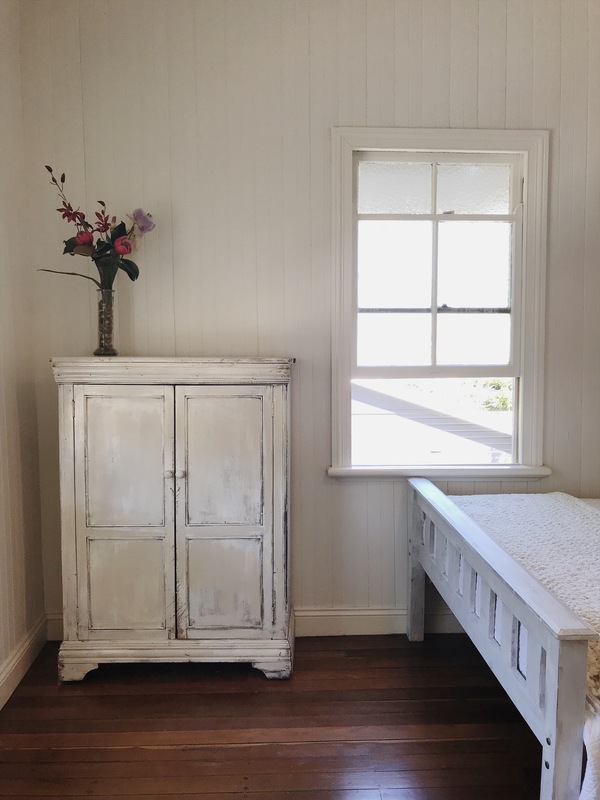 Choosing the right paint colour has been a bit of a process for us and we have made a few mistakes and ended up repainting some rooms. The colour we seem to have finally settled on is Dulux white cotton in the washable a tough range. Which is great for busy family homes! It’s a warm white without being creamy and seems to work well in our north and South facing rooms. Of course the light must be totally different in Australia but maybe one to try out and see what you think. I will look forward to your next renovation updates. Thanks for your sweet comment and for the question. Unfortunately, our bedroom will be the darkest room in the house with no windows. However, we hope to always keep the doors open to our ensuite bathroom — which is lined with big windows and light flooding in. My hope is that the French doors leading to the bathroom will be open most of the time (and even when closed, the doors have windows within them, so some light will still enter). It’s also going to pose a problem come summer when it’s so hot and we will want draft into our room. This is definitely a downside to this bedroom. I’m probably going to regret not investing in aircon in that room! Thank you for sharing such a detailed post, Courtney! I’ve always been interested in home design and really love your style❤️ I’m a little weird like this, but I am SO thankful you included house plans. I love to see pictures, but what I’m always most curious about is the whole layout of everything. So thank you! Can’t wait to see the final product! Hi Courtney, love the plans and can’t wait to see the final product! I’m curious to know whether you will have any mosquito / fly screens for the summer? Or any tips on how to get around this 🙂 Best of luck with the renovations! Looks so beautiful! It is really a dream house. Is the Pinterest link Marilou’s kitchen from Trois Fois par Jour?… very famous cookbook here in Québec! What a lovely house! I love hearing about people’s inspirations and what leads to their final design decisions. No house is perfect, yet it sounds like you are making the most (+ tax) of this wonderful find. Best of luck … and keep the reno posts coming! 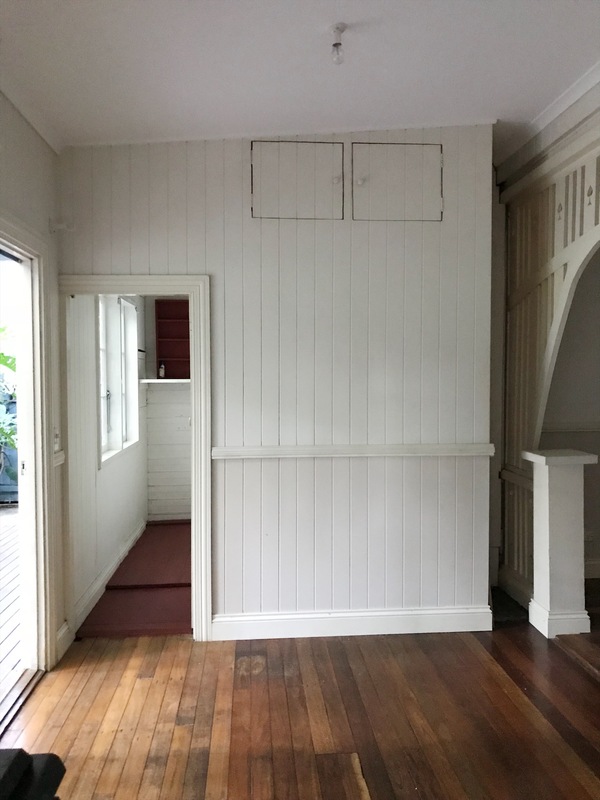 I was wondering since it is an old house that’s been painted over and over, if the panelled walls are to be sanded before painting them again? All best of luck with your new home! Thanks for sharing the renovation process- I am about to start mine too so this is so helpful! 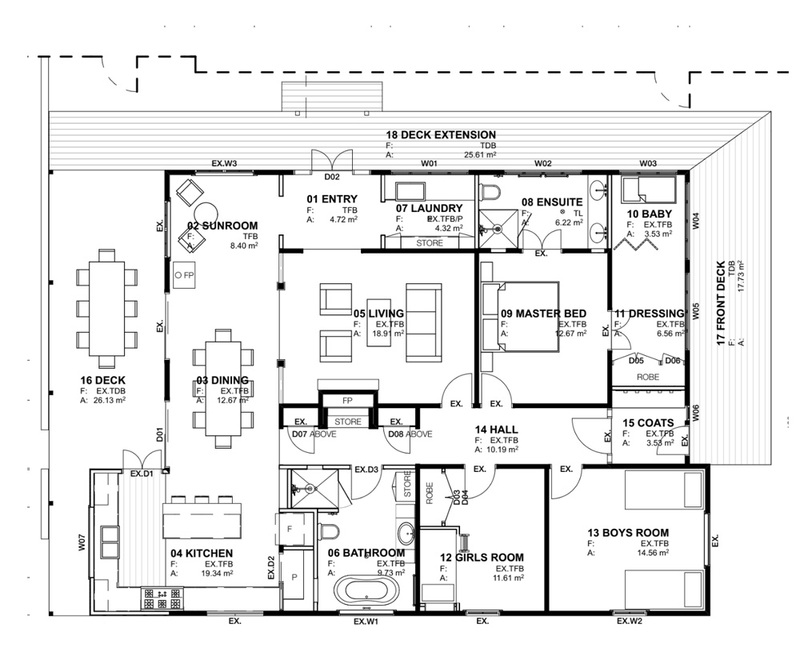 Your new floorplan is brilliant, love it! 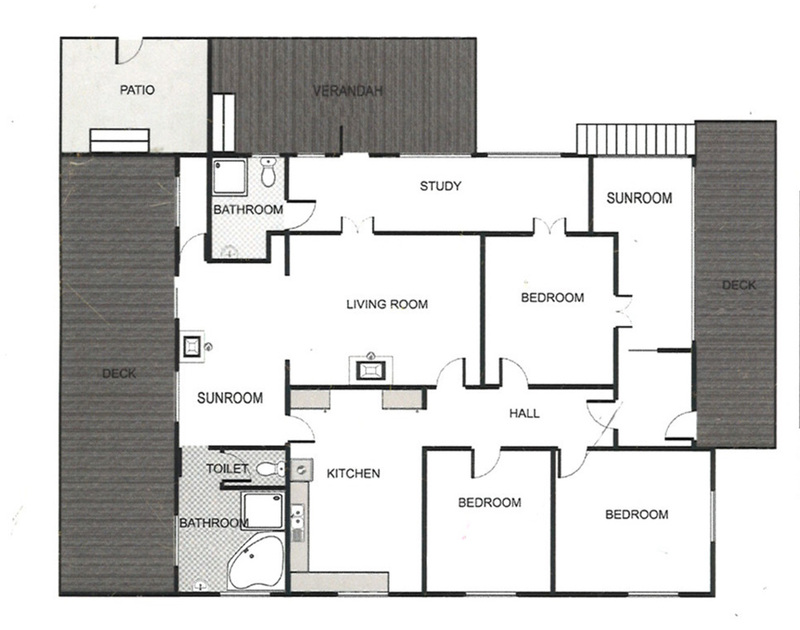 just curious if you got help from interior design/architect to help you navigate? 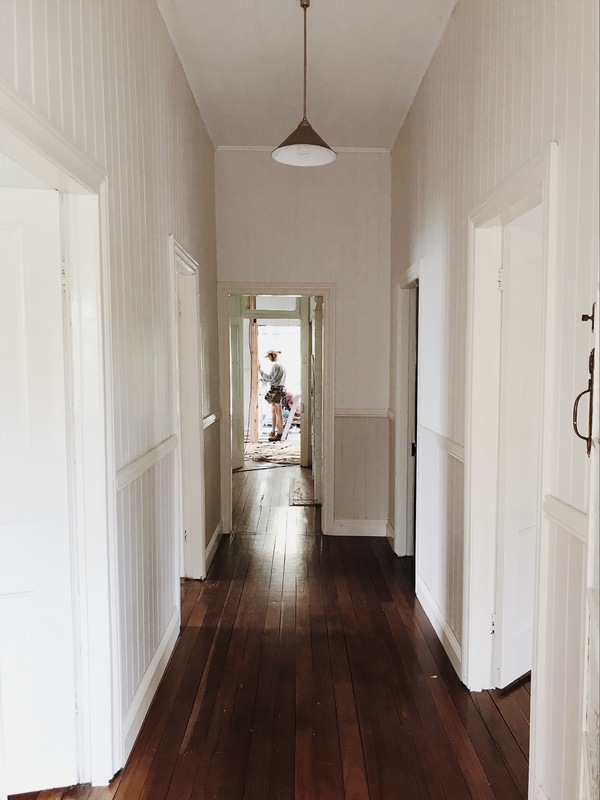 Like I know I wouldn’t think to convert study into laundry/master bathroom for sure..
I’m inspired by your life in Australia and specially by this home renovation. It’s gonna be so beautiful ! And I approved a lot to have a not such a big space because is cheaper and the cleaning is faster… And I always find that more cosy. And not so much tips for paints, my husband and I just love fresh light white. Have fun on the process and thanks for sharing !! Your plans look amazing! We are currently considering renovating a bungalow in U.K. and am very interested in the room layout! Can I ask what the size of your place is in square metres? Would be most helpful. Good luck with the refurb!! Thanks for your comment, and how exciting that you’re considering renovating! I’ve really enjoyed the process. I just asked my husband about the square metres and he told me it’s 190 square meters. Hope that’s helpful! paint colour skimming stone by farrow and ball – our painter copied this colour into washable deluxe paint (apparently easy to do !) – the big delux stories can mimic colours. We had strong white in our kitchen and i felt it was almost clinical this is much better and warmer. Ah congrats on buying your home in Sydney. It sounds beautiful! I was wondering what color white you chose for paint! So hard to choose! Love your home! It’s the most difficult decision!! We chose ‘Natural White’ by Dulux. It’s a warm white and it felt right in our old home. But I think every home is different — it depends on the light that comes in, the colour of the floors, and other elements in the home. Beautifully designed Little Quote Jars, by Make History! Katrina Campbell PhotographyCapture your kid’s & family's spirit!